One of my lovable, little quirks is that I am very particular about what I drink from. The size and shape of glasses and cups are important to me. That means I am very picky about the glasses and mugs I buy and use. 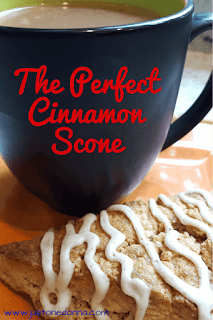 Today I want to talk about my coffee mug obsession and share a recipe for Cinnamon Scones. 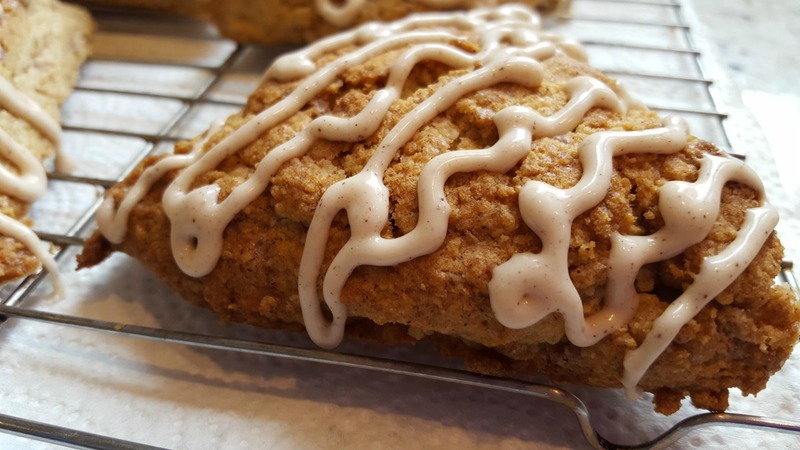 These Cinnamon Scones pair very nicely with anything you might want to drink from your favorite mug. Last weekend I had breakfast at a new-to-me local breakfast place. It is a cute little place with the yummiest breakfast, but the thing that blew me away was their coffee mugs. I fell in love with those mugs the minute they were placed on our table. I loved the matte black color on the outside and the bright colors on the inside. I loved the shape. I had to have those mugs. I immediately started my online search. Good news! I found them. My mug obsession started years ago with a hand-made pottery mug that I had received as a wedding shower gift. I loved that mug. I'd had that mug for about twenty years until it tragically broke. I was heartbroken and I'm not exaggerating. It was the mug that held my coffee after the long nights when my boys were babies. It was the mug that held my tea on those days I wasn't feeling well. Holding that mug gave me comfort and made me ready to start my day. I searched and searched for a replacement. The shape was always wrong. The size was always wrong. The weight was always wrong. Hubby found me a close replica for a birthday gift a few years ago, but that replacement mug never felt quite the same in my hands. Something was off. So, the search continued for the perfect mug. I have several mugs that are acceptable stand-ins, but none that I adore. The minute I held this new mug in my hand it felt just right. 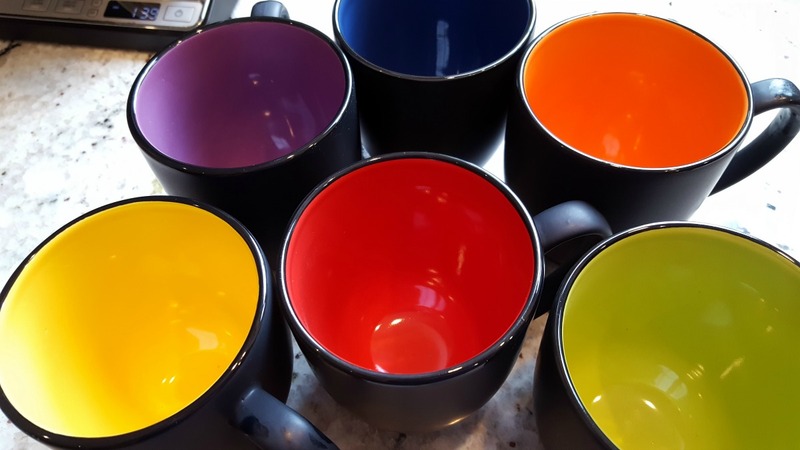 I ordered the six-pack of these mugs with an assortment of interior colors. That way I can use whichever color suits me on any given day. Having six mugs means I have many spares in case any of the mugs breaks. These new mugs are nothing at all like the mug that started my obsession, but they feel right in my hands and are a cheerful way to start the day. Another cheerful way to start the day is with these cinnamon scones. Cinnamon has always been one of my favorite spices. I use it every chance I get. I even sprinkle cinnamon in my coffee every morning. I don't remember when or where I heard it but supposedly cinnamon helps to reduce the dastardly inflammation that is the cause of so much that ails us. Since I love cinnamon it doesn't bother me one bit to eat as much of it as I can. That is why I chose cinnamon scones as the perfect treat to pair with my new mugs. 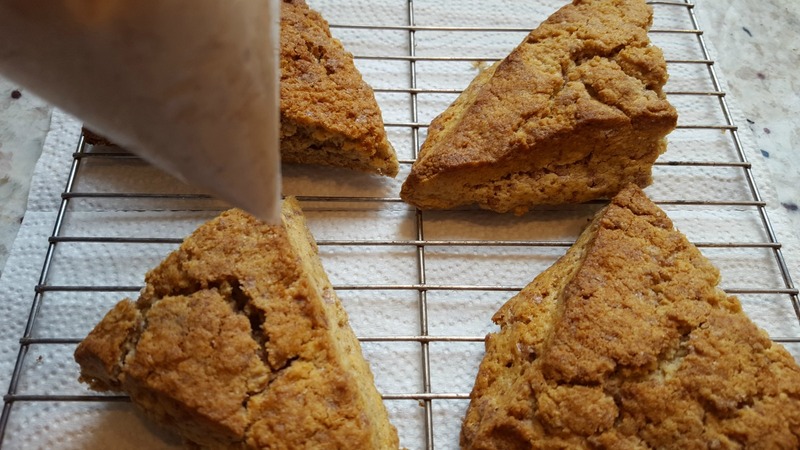 This recipe makes a light scone with a nice crunch on the outside. You'll love the tender texture and the big cinnamon flavor. 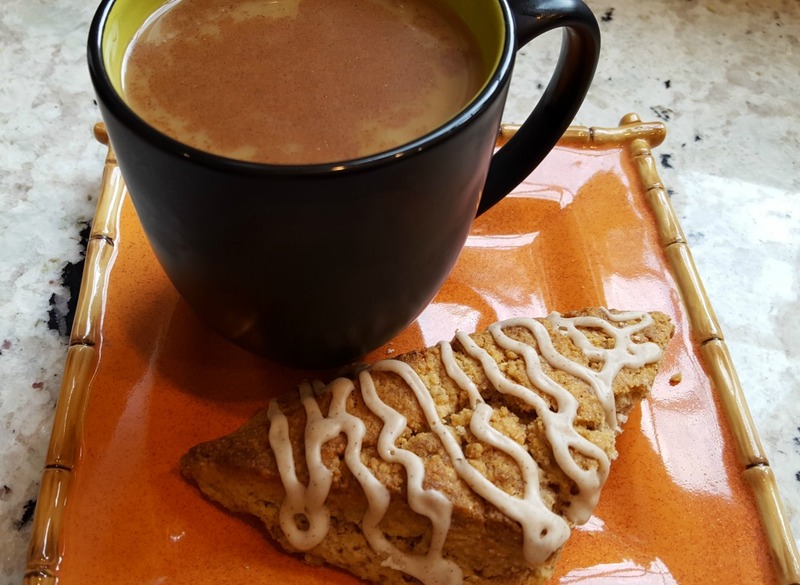 Make these scones when you have time to sit and enjoy them with your favorite hot beverage, in your favorite mug. Combine the flour, sugar, baking powder, cinnamon, and salt together in the bowl of your electric mixer. Add the butter and mix to combine. The mixture will be unevenly crumbly and that is good. Add the cinnamon chips and stir to combine. Add the lightly beaten eggs and the vanilla into the flour mixture and stir until the mixture comes together. Don't over do it. You just want the mixture to hold together. Prepare a well-floured space on your counter top. I used my silicone baking mat dusted with flour. You are going to measure the size of your dough, so you'll want an area that is at least 18 inches long. Scrape the dough onto the well-floured surface. Gently roll and pat the dough into a 3-inch by 18-inch rectangle. It will be 3/4 to one inch thick. Cut the rectangle into six equal squares, each 3x3 inches. Diagonally cut the each square in half and place on a parchment paper or silicone baking mat-lined baking sheet. Place the baking sheet in the freezer for 30 minutes. This will ensure your scones rise well and are light and tender. Preheat your oven to 425 degrees F.
After thirty minutes bake as many scones as you like. Wrap the remaining scones individually in plastic and bag for the freezer. That way you can have fresh scones whenever the spirit hits. Bake the scones for 15-20 minutes, or until they are puffed and brown. Remove the pan from the oven and allow the scones to cool. While the scones are cooling mix the icing. Mixed together 1 cup of confectioner's sugar, 1/2 teaspoon of cinnamon, 1/2 teaspoon of vanilla, and 2-4 tablespoons of milk. You want the icing to run easily from the spoon. Transfer the icing to a small plastic bag. Snip the corner to pipe the icing over the scones. Serve immediately. Warm is best...and oh, so delicious. Hello Donna- is there a substitute for cinnamon chips? Sounds like a wonderful recipe and I am buying the mugs! Hi Kay! I haven't found a substitute for cinnamon chips anywhere. You can make these without the cinnamon chips and you'll have a little less cinnamon flavor. You could also try adding a little more cinnamon to the batter, a quarter teaspoon at a time. If you are a cinnamon lover it is worth it to buy the cinnamon chips just for this recipe. That's what I did. 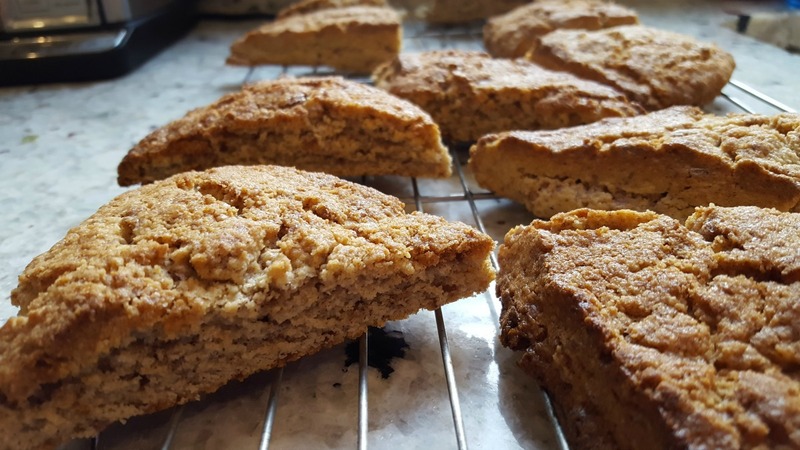 Make an extra batch of scone batter and freeze the unbaked scones for another day. You can bake the scones from frozen. Kay, I hope you love the mugs as much as I do. You can write on the outside with chalk!! The one with the yellow inside is my favorite because it's like looking at sunshine.